U.S. Decision To Cut Central America Aid Could Worsen Migrant Crisis, Experts Say The Trump administration notified Congress that it will seek to suspend aid authorized in 2017 and 2018 to El Salvador, Guatemala and Honduras, saying the money isn't helping ease the border crisis. 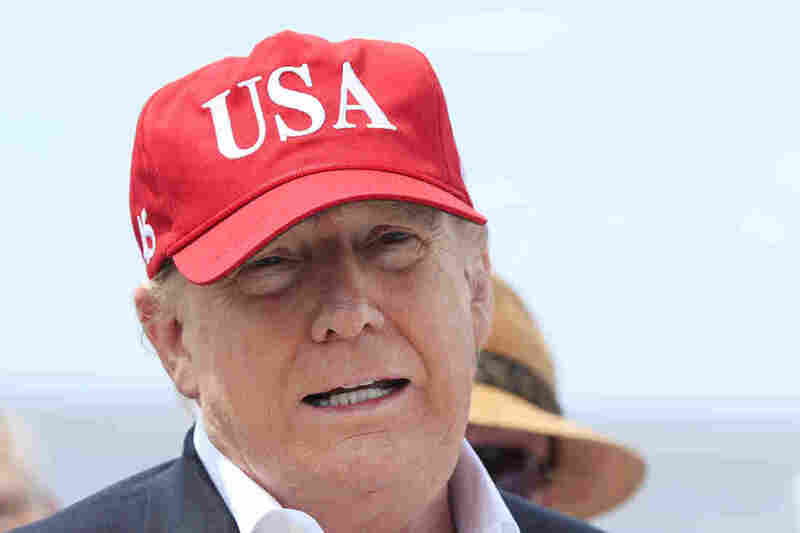 President Trump says he will close the United States' Southern border, or large sections of it, next week if Mexico does not immediately stop illegal immigration. Here Trump speaks to reporters during a visit to Lake Okeechobee and Herbert Hoover Dike at Canal Point, Fla., on Friday. President Trump's call to cut aid to El Salvador, Guatemala and Honduras is raising concerns among lawmakers and national security and development experts, who say cutting aid will exacerbate the migrant crisis that is already crippling U.S. resources at the Southern border. A spokesperson for the U.S. Agency for International Development told NPR on Tuesday that the agency is carrying out the president's order to end foreign assistance programs for the Northern Triangle, the area that comprises those three Central American nations. The spokesperson said the agency is still finalizing the allocation of funds for 2019. Trump has blamed the Central American countries for sending migrant caravans through Mexico to the U.S. border, an idea Trump has repeatedly promoted to raise the alarm about illegal immigration. In tweets on Saturday, Trump also returned to his previous threat to completely seal off the Southern border, blaming Democrats and Mexico for the turmoil at the border. In an interview on CNN on Sunday, acting White House Chief of Staff Mick Mulvaney defended the administration's decision to stop aid, claiming U.S. funding to Central America isn't doing enough to stifle the recent spike in migrants coming from the region. "The people say it's working, but the proof is in the numbers. It's not working well enough to help us solve our border crisis, and that's what the president is focused on," Mulvaney said. "And if we're going to give these countries hundreds of millions of dollars, we would like them to do more." The U.S. has allocated $2.1 billion in aid to Central America since 2016, according to a report this year by the Congressional Research Service. Aid to Central America greatly increased under the Obama administration to promote economic prosperity and reduce violence in the region, with the idea being that achieving those two goals would mean fewer people would need to flee to the United States. Former Secretary of Homeland Security Jeh Johnson says that this investment is "beginning to show positive signs." "Suspending aid to Central America, as President Trump has threatened to do, in my judgment, is the exact wrong thing to do," he told Morning Edition. Much of the appropriated funding isn't sent directly to governments. Instead, it is sent to nonprofits and nongovernmental organizations that are working to deal with the root causes of migration, according to NPR international correspondent Carrie Kahn, who's based in Mexico City. The funds have supported efforts such as strengthening police forces, border security and judicial systems, as well as gang prevention and food security programs. Aid groups worry that suddenly slashing funds will have big repercussions, according to Ken Baker, CEO of Glasswing, a nonprofit group working in Central America. "One of the things that has been talked about is how, you know, that [these countries] aren't doing enough. But they really do work with us," Baker says. "They do work with the U.S. government. It is in their interests." Many experts say it's too soon to determine whether those programs are working, but in El Salvador, officials have praised the country's cooperation with the U.S. for dramatically reducing migration. The number of Salvadorans detained at the U.S. border dropped by more than half, down from nearly 72,000 in 2016 to more than 31,000 in 2018, according to U.S. Border Patrol data. "The decision to cut funding contradicts the results of what we have accomplished together," Raúl López, El Salvador's vice minister of justice, said Monday. "The fact is that migration from El Salvador is declining, thanks to our work." The U.S. Global Leadership Coalition, a nonprofit that supports diplomacy in the U.S., found that in areas where the U.S. Agency for International Development worked in El Salvador, the homicide rate dropped by 45 percent on average from 2015 to 2017. When homicides spike, so does migration. For every 10 murders in El Salvador, Guatemala and Honduras, six children leave for the United States. Liz Schrayer, president of the U.S. Global Leadership Coalition, told Here & Now's Robin Young that more work needs to be done in the region to hold these countries accountable and to support active diplomacy. But she warns that without aid programs, the migrant crisis will worsen. "One thing we should not be doing is pulling out our aid programs. If we do that, it's only going to exacerbate the unrest," she says. "People will leave if the violence continues, if they don't have economic opportunities and if they can't put food on their table."